One thing I really like about cooking pork dishes is that pork does fantastically well absorbing the flavors you surround it with. Yet another reason why the pig is such a magical animal. Think about it, from sausages to bacon to tenderloin and chops, a lot of the flavor comes from the herbs and spices used in the preparation and cooking. Pork is a wonderful blank canvas for any cook and pork belly is very good choice because it has layers of delicious fat to keep it moist. Reasons enough for me to make braising a perfect technique for preparing pork belly. Especially as we head into cooler Fall weather. 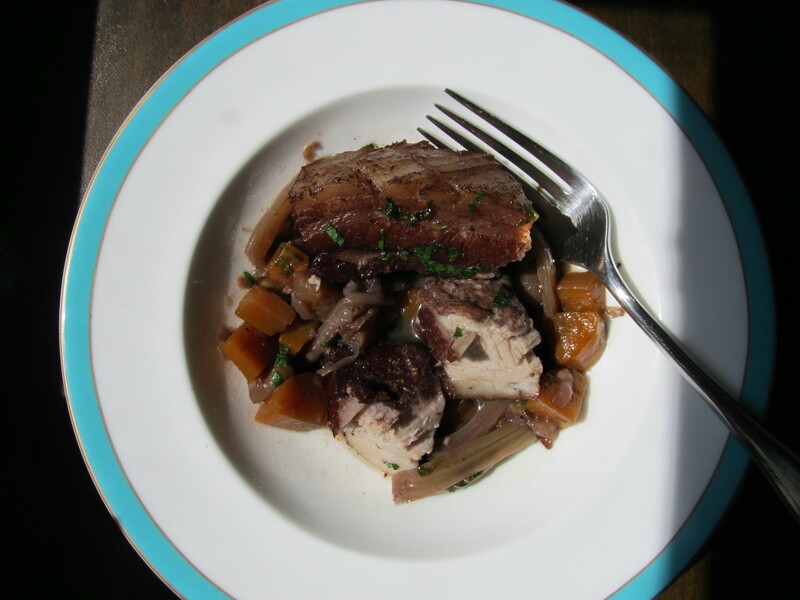 The idea for this came to me while looking through Ruhlman’s Charcuterie and seeing a recipe for pork belly confit. While intriguing, it looked rather intricate for a weeknight dinner but I liked the idea of doing something with pork belly so I decided to do a simple braise instead. Pork belly has become increasingly popular over the past couple of years, probably due its cost and ease of use. It used to be pork belly was only readily available from my butcher but this year I’ve been seeing it more and more in grocery store meat departments. Now, just because pork is a blank canvas doesn’t mean you can cook it with anything. Obviously apples go with pork (e.g. pork chops with apple sauce) but plain old apples can be a little boring (e.g. pork chops and apple sauce). To The Flavor Bible! According to that wonderful cooking book nutmeg goes with pork. It also goes with apples. Throw in some other items which pair well with the two like fennel, carrots, and shallots, and you’ve got the makings of a deeply flavorful yet spiced sauce perfect for a cool fall evening. This turned out like you think it did, delicious! You can taste the nutmeg hovering around in the sauce and on the pork but it’s not overpowering. I think I added just the right amount. Nutmeg always worries me since it can really overpower things and add a bitterness if you use too much. Also, I think it was a good idea to forego using apple cider as the braising liquid, as I was tempted to do. Last week I made a different version of this dish (test kitchen, what you think I just wing it?) using apple cider but the sauce ended up too sweet and apple-y. You couldn’t taste anything else. This week I used some wine, water, and calvados in the hope that the vegetables and spices would impart their flavors more. They did. There’s a sweetness to the sauce but it’s not cloying. The only thing you need to be aware of is to keep your eye on the liquid level when braising and add some if it needs it. 2 lbs pork belly, skin removed, cut into ½ lb pieces. Score the pork belly with a knife in a broad criss-cross pattern and rub with the salt, nutmeg, and fennel pollen. Place in a baking dish and refrigerate for at least an hour. The longer the better of course. On the stove over medium heat, heat some oil in a Dutch Oven or a similar pot which can go in the oven. Brown the pork belly pieces, remove to a plate and set aside. Pour off the fat from the pork belly leaving a thin coating in the pot. Add the shallots and garlic and sauté for 1 minute. Pour ¼ C of the calvados in and deglaze the pot scraping up the bits. Next, add the butter. When the butter has melted add the carrots, apple, and fennel and continue to cook for 5 minutes. Pour in the wine, water and remainder of calvados. Bring to a boil. Return the pork belly pieces back into the pot with any juices, cover and place in oven. Cook the pork belly in the oven for 90 minutes. Check for tenderness. Is it tender enough for you? No? Put it back in for another 30 minutes. Remove pot from oven. Gently remove pork belly and set aside on a plate. Place pot on stove over a medium-high burner and reduce sauce as needed. Season and add parsley. Return pork belly to sauce. Serve with red cabbage or mashed potatoes. Next Post Oktoberfest Sausage – Onion Brat! Probably should be fine. Make it your own!